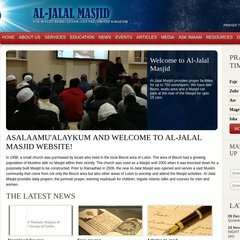 Topics: Polls, Prayer Timetable, Masjid Staff, Masjid Organisation, Services, and Funeral Services. It is hosted by Network Ip Space - Ohtele (England, Manchester,) using Microsoft-IIS/7 web server. ASP.NET is its coding language environment. Its 2 nameservers are ns1.primedns.co.uk, and ns2.primedns.co.uk. PING (195.12.48.155) 56(84) bytes of data.